Charity Sanders admits she's a pretty unlikely beach volleyball player. She grew up in Kansas, for starters, was "lanky and uncoordinated," and her fair skin made the 29-year-old generally avoid direct sun. That, and she's deaf. "A minor detail," Sanders writes in a recent email interview with Yahoo News. Sanders and Nancy Moore, former standout indoor volleyball players at Gallaudet University in Washington, D.C., were selected along with another pair of deaf beach volleyball players (Michelle Skowzgird and Shana Lehmann) to represent the U.S. next month in women's beach volleyball at the 2013 Deaflympics in Sofia, Bulgaria. They'll be seeking the U.S.'s first-ever gold medal in the event—that is, if they can raise enough money to get there. While the International Olympic Committee officially sanctions the Deaflympics, the U.S. Olympic Committee and U.S. Special Olympics Committees don't provide funding for athletes looking to attend them—they believe that deaf and hard of hearing athletes should be competing in the Paralympics. "This is a complex issue," Sanders, who was born deaf, writes, "but in the Paralympics, they have a range of classifications for athletes, from differing levels of muscle power to missing limbs, or intellectual disabilities. And the fact is that deaf or hard of hearing athletes have no real place in the Paralympics." So Sanders and Moore, who are currently training in Huntington Beach, Calif., have turned to crowd funding to cover the costs—estimated at $4,500 each, including airfare, travel, accommodations and uniforms—to compete in the event, which begins July 26. And fundraising, like training, has become part of the pair's daily routine. "The deaf community is essentially a small, concentric circle," Sanders writes. "So that is absolutely the biggest fundraising challenge. Many U.S. Deaflympic athletes have overlapping circles of friends—it's like one gigantic Venn Diagram folding on itself over and over again." Sanders and Moore have been using Rally.org, a crowd-funding site similar to Kickstarter. So far, Sanders has raised $3,000, Moore $3,200. 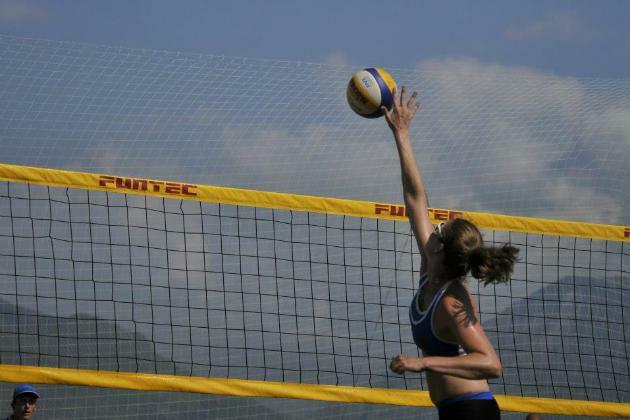 For Moore, who lost her hearing after contracting spinal meningitis at 14 months old, it would be a second trip to the Deaf Olympics as a beach volleyball player. For Sanders, her first. After this year's Deaflympics are over, Moore, 48, hopes to return in 2017, possibly as a coach. Sanders, who recently received a master's degree in urban planning, wants to enter the full-time workforce. "But there's a strong possibility I'll be back," Sanders adds. "I love competing too much to be able to give it up."